I'd like to thank Mr. Inada, a member of Hokkaido Classical Movie Society, who kindly offered all the pictures of this site. Please do not use the pictures without permission..
After finishing technical highschool, he had once worked for a railroad construction office. in Nara to be an actor. *U. Ichikawa('07-'99) is one of the most popular chambara movie star. Then, Nikkatsu, a movie company, was interested in his unusual baseball skill and drafted him. he was not more than a part of an officer crowd in movies. he was asked by the Asia Movie Company and got his first leadingr role in 'Sakebu Kojin Yama' (see the first and second picture) which was also the first work for the company. One month laterr, he played another leading role in 'Kyokukiri Kaido Tabi'. But, it was not easy for a small enterprise like the Asia Movie Company to survive. It went bankrupt without making enough money. 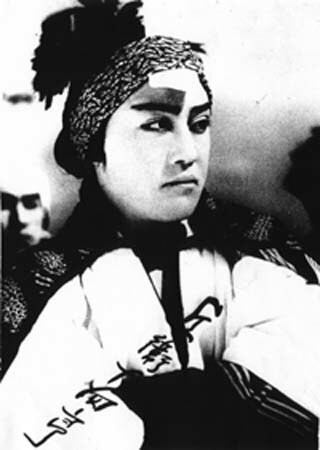 When Dirctor Sentaro Shirai started the Daiichi Movie Company in the same year, Konoe who respected him followed and played a leading part in 'Tenpo Karakuri Den'. The compnay failed again this time. 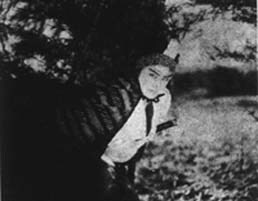 In 1935 when Konoe was 21, he moved to the Daito Movie Company as Director Shirai did. Ninkichi(Konoe) and Okiku(Yamamoto) love each other deeply. But his fellow, Chokichi(Yuki). claimed him that Okiku's brother had taken Mt.Kojin, that was Chokiti's territory. So, he send Okiku back to her brother's place in tears and decided to fight to get Mt Kojin back for Chokichi by a code of conduct. Ninkichi and Chokichi went to Mt Kojin with 7 guys sent by their boss, Jirocho(Masamune). 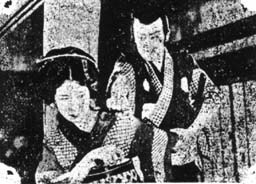 On the way to Kojin, Chokichi met a prostitute, Kosada(Hanayagi) and was asked to run away with her. Next day, all went to Mt Kojin. White Kimono they wore meant they were even ready to die. Ninkichi was wounded. While Ninkichi was being sent down the mountain in a strech with 7 guys guarding him, Okiku, who came after him tried to find him at the battlefield, crying his name. Ninkichi was going down in a strech hearing her cry. Ryuhei Azusa (konoe) is a samurai without a boss, making money from taking off a percentage from thieves and imposters. So, he concerned in Dennai Arakawa(Okamura) and Shitigoro Anakura(Ichihara), who were extorting money from Mikawa-ya(Matsuui). He was surprised when he saw Oyuki(Yamamoto) coming out from Mikawaya's house.